Nestled on the Caldera cliff with a heavenly view of the volcano, the charming white washed villas, the surrounding islands and the Aegean Sea, Andronis Luxury Suites combines classic luxury with modern minimal style. The interior design and architecture balance the traditional Cycladic and contemporary style. All Suites are equipped with satellite TV, individual CD player, direct dial phone, internet access, safe deposit box, mini bar, hair dryer, private indoor or outdoor Jacuzzi (the Exceptional Suite features a Cave Jacuzzi), bathrobes, slippers and lots of amenities. The hotel has a restaurant, swimming pool with bar service as well as bellboy service. We loved the outdoor balcony with the jacuzzi, and the breakfast on our private balcony every morning was amazing. The service here was impeccable. I needed an extra suitcase, and the hotel sent someone to purchase one for me in Imergolvi to ensure I could bring back the wine I had purchased on a wine tour. We did have a number of issues with the lights and power going out, which appeared to happen throughout the hotel. We did enjoy our stay and possibly would stay there again. Wow!! This hotel is absolutely breathtaking! A phenomenal view on the edge of the cliff of a mountain overlooking the breathtaking sea view! Uli recommended this hotel to us! I couldn't be happier about this choice! We had a jacuzzi indoors/outdoors overlooking the blue endless sea. Every morning breakfast was delivered to us on the balcony with homemade jams and an assortment of croissants and pastrys. Not to mention a full breakfast menu to order from as well. It was perfect! The staff was very kind and accommodating! They welcomed us with a glass of champagne and showed us the beautiful hotel. The infinity pool was one of my favorite places to hangout with the most breathtaking view. I can go on and on about this hotel! 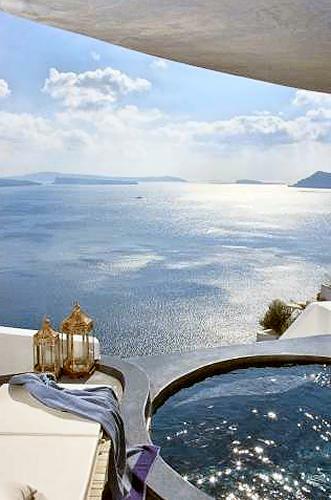 We would recommend it to anyone traveling to Santorini!